For people living with rosacea, coping with the chronic flushing of the face associated with the condition can be troublesome. Dealing with rosacea can provoke avoidance of social activities and even lead to depression. As you age, dealing with rosacea skin can become more problematic. The flushing of the face associated with rosacea is caused by blood vessels in the face dilating. The repeated over-dilation of these blood vessels can become permanent, leading to the skin becoming ruddy and the enlarged blood vessels to be more visible through the skin. Rosacea is a long-term skin condition causing redness on the face – usually the cheeks, nose and forehead. Rosacea is characterized by a tendency to flush and blush after exposure to triggers such as stress, sunlight, spicy foods and alcohol. When a person blushes, blood vessels on the face dilate. In those with rosacea, this happens so often that over time the blood vessels remain enlarged and the skin looks ruddy. 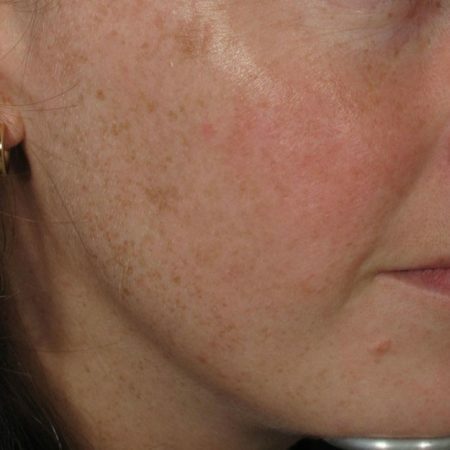 Some rosacea sufferers go on to develop inflammatory pimples. In many, the eyes are affected too. As with a number of other skin conditions, if you suffer from rosacea you may find that your flare-ups are often set off or made worse by a number of triggers. By recognizing and managing these triggers, it is possible to reduce the impact of rosacea on your life. With fewer flare-ups, the long-term damage incurred as a result of rosacea skin is lessened. Ocular (eye) complications, and other less common events like enlargement of the nose (Rhinophyma) can be reduced by seeking timely care. Beyond learning to manage triggers such as stress, sun exposure, and alcohol, there are a number of treatments available that can offer relief from your rosacea. Note: Certain treatments for medical conditions considered to be elective and/or cosmetic are not covered by Medical Services Plan of BC. Usually the cheeks, nose and forehead.